Known for its beautiful lakes, temples and scenic environment, Nainital is one of the most sought-after honeymoon destinations in the country. 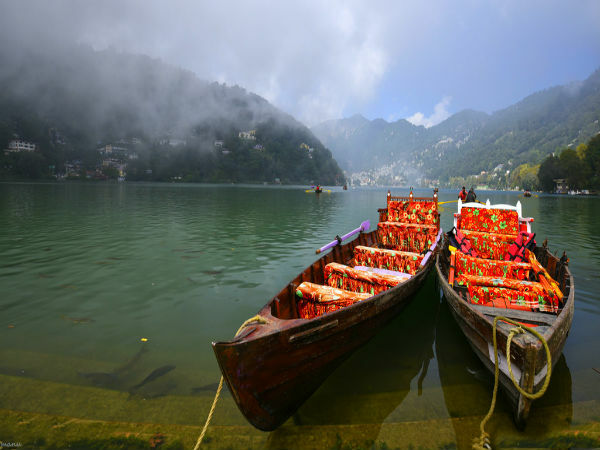 Nainital gets its name from Naina Devi, who is considered as the patron goddess of the region. According to mythology, this place is where the eyes of Sati fell off, making it a Shakthi Peetha. Nainital is located on a valley which holds a pear-shaped lake that is spread across 3 odd km. It is also surrounded by a number of Himalayan peaks; the Naina Peak is the highest, which is followed by the Deopata and the Ayarpatta respectively. The place can be visited anytime throughout the year; however, the months from October to June are considered to be the best time to visit as the weather remains pleasant and is more attractive, especially during the winter months. By Air: The nearest airport to Nainital is the Dehradun airport which is located at a distance of 173 km. The airport is well connected to a number of major airports across the country, such as Delhi, Mumbai, Kolkata, etc. By Train: The nearest railhead is at Kathgodam which is located at a distance of 35 odd km from here. The station is well connected to most of the major towns and cities in the state and to a number of them outside as well. By Road: One of the best ways to reach Nainital is by road as the place has a very good network of roads. One would come across plenty of buses which operate to and from the hill station to major towns and cities. The total driving distance from Delhi to Nainital is about 298 km which would take you about 6 to 7 h to reach via the NH 9, which would take through the suburbs of Delhi and through some small towns and cities across the state of Uttar Pradesh. Located on the banks of the Ramganga river, Moradabad is located about 167 km away from Delhi. The city was founded in the year 1625 AD by a person named Rustam Khan and was named after prince Murad Baksh, who was the son of Shah Jahan. The city is also known as Pital Nagari or the Brass City as it is well known for the brass handicrafts industry. Due to its Mughal connection, the place has plenty of monuments which have stood the test of time to narrate the stories from the bygone era. Some of them are the Jama Masjid, Mandawar Ka Mahal, Najibudaulah's Fort, etc. There are a large number of temples too; some of the most well-known amongst them are Pataleshwar Temple, Bade Hanumanji and a Sita temple. Nainital is also known as the Lake district of India and as the Queen of Lakes due to the presence of a large number of lakes in the region. The place is one of the most popular hill stations visited by tourists, not only from the various parts of the country but also from abroad. The hill station was developed in the year 1841 by a person named P. Barron, who constructed a pilgrim lodge here which slowly gave rise to many more and the place transformed itself to a well-developed town. Nestled in the Kumaon hills, the place is also the base camp of a number of treks to various Himalayan peaks which attract trekking lovers from across the globe. Located on the northern bank of the Naina Lake, the 15th century shrine is considered one of the 51 Shakthi Peethas in the country. The temple was rebuilt in the year 1883 after being destroyed in a massive landslide which hit the place. According to legends the shrine marks the spot where the eyes of Sati fell off from her corpse and hence, is considered as one of the holiest shrines amongst the followers of Hinduism. One of the major attractions in the town is the lake, which attracts a large number of visitors. The lake takes the shape of a crescent and is surrounded by peaks and lush greenery, which creates a magical feel for those visiting the spot especially during the early morning hours and in the evenings, when the place is covered entirely in mist. Naina Peak, the highest point in the town and one of the major attractions here, is also known as the China Peak and is a favourite spot which attracts a large number of trekkers. The peak in addition gives a bird's-eye view of the entire town and the majestic Himalayan ranges. Located at an altitude of 1951 m, the temple is dedicated to the monkey god, Hanuman; the temple was built here in the year 1950 by Neem Karoli Baba. Located 3 km away from town, the shrine is one of the major tourist draws not because of its religious values but also for its brilliant views of the surroundings.